I don’t know why I hold out and believe that somehow there will be an ending that’s not some completely perfect happy ending. I’m really annoyed that Mirai disappears and then returns to life in some nonsensical fashion. There’s literally no explanation for her sudden reappearance. Also, it’s revealed that Izumi also harbors a youmu, but there really is no meaning to that. Those are my main problems with this ending. That being said, I did like that a majority of this final episode was spent in some sort of action. Also, I liked the fact that Akihito wasn’t completely useless and was able to use his youmu hand to fight to some extent. Well, it’s over, I guess. On to the next one. I’m really annoyed that the last 2 minutes of the show were basically put there only to satisfy the fans. 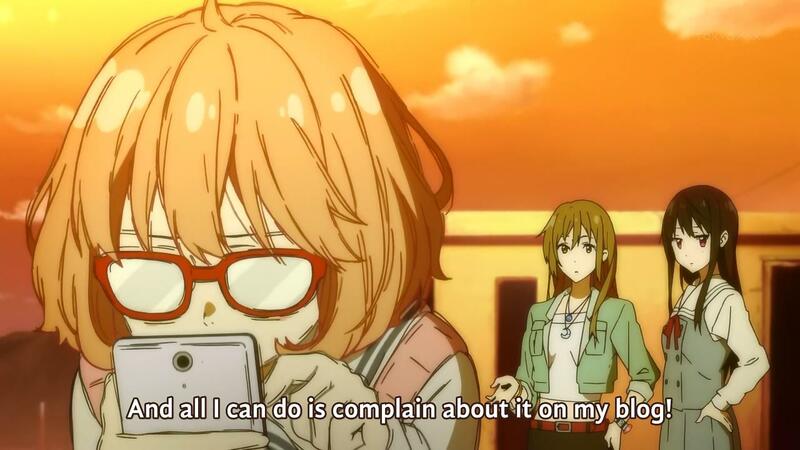 I’m curious how Mirai managed to fight the Kyoukai no Kanata for three months without any apparent damage to herself. 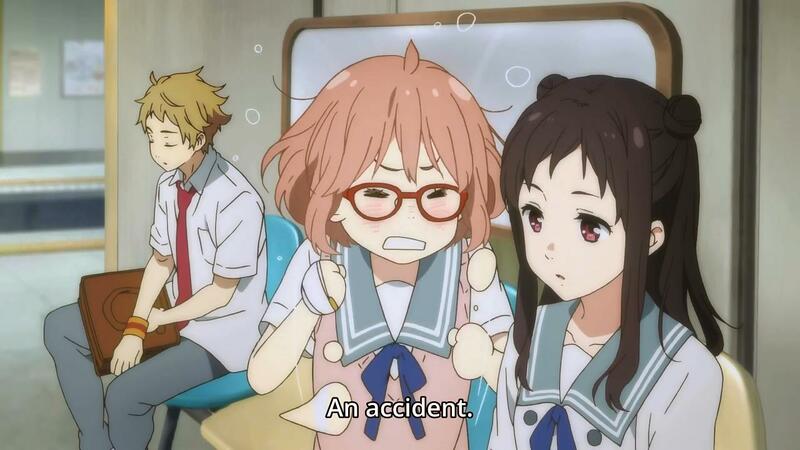 I mean, right as Akihito wakes up, her glasses get cracked and her clothes get messed up. How did she manage before? 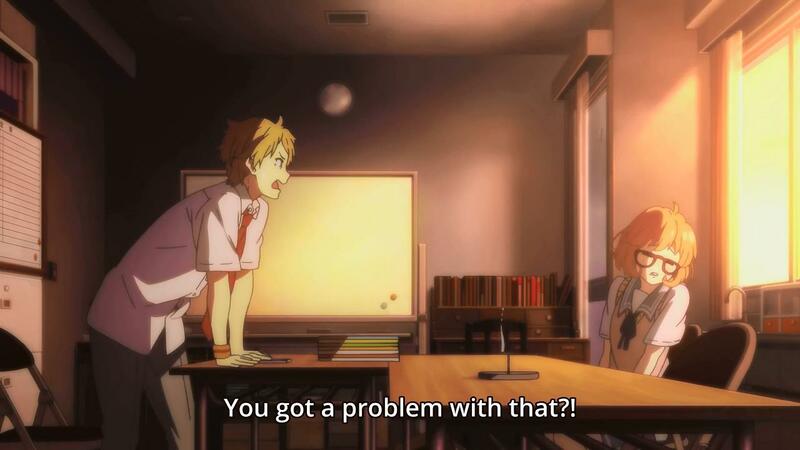 But that aside, Akihito did what we expected in going up to the alternate dimension to help Mirai fight. So is next week the last episode? Final battle and everything’s resolved? I’m curious how they’ll end things. Will they leave Akihito as a normal human and defeat the Kyoukai no Kanata? Or will Akihito have to accept it back into his body again and regain his immortality? I’d say both are fairly equally likely. Also, what’s Miroku’s role going to be in the final battle? You can’t possibly tell me that his only role was to make the Kyoukai no Kanata stronger with stored energy. Kyoukai no Kanata Episode 10: She was the sacrifice?? Oh snap…it was her plan all along! 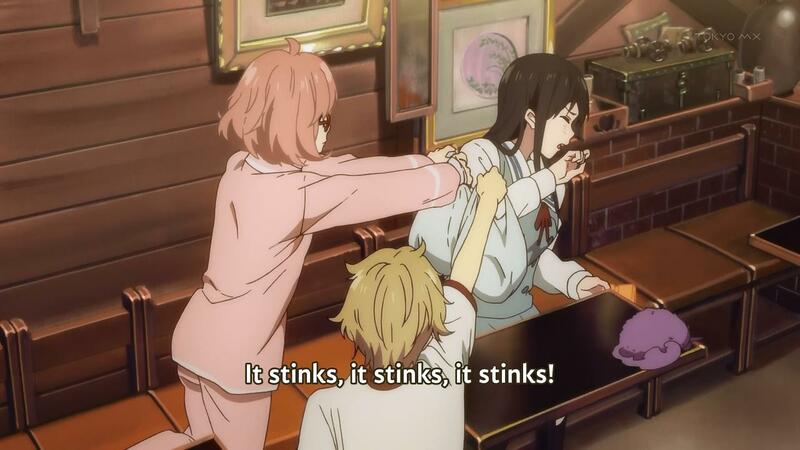 It looks like Mirai sacrificed herself to keep Akihito alive. 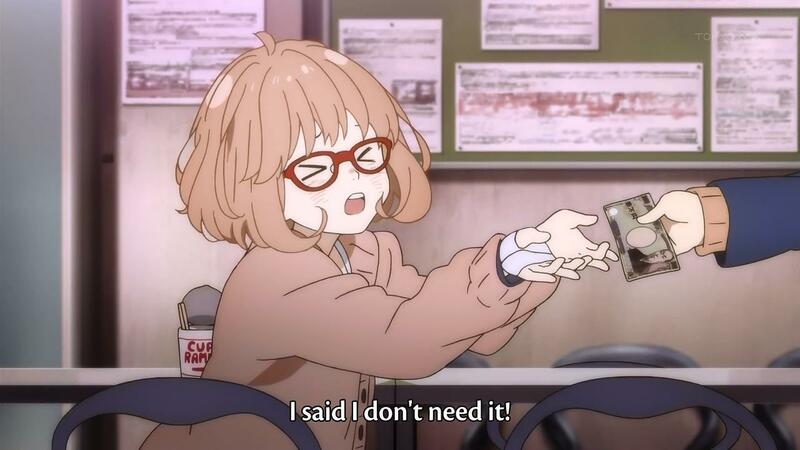 But doing so required accepting Kyoukai no Kanata into her own body. However, judging by the end of the episode, she’s still alive and currently fighting inside that dark sphere floating over the city. How very convenient for her not to have died after her entire body vanished. 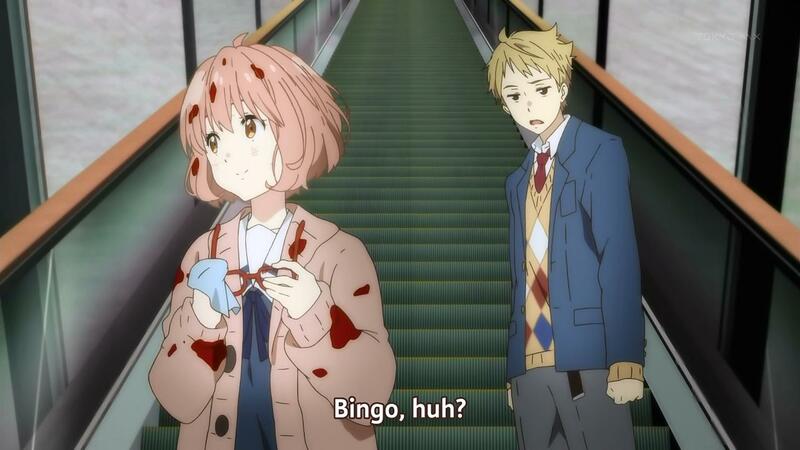 Anyway, it looks like Akihito will have to go save her and help her defeat Kyoukai no Kanata. Will they be able to kill it or will it just continue living dormant inside one of them? I mean, how much help can Akihito really be now that he’s no longer immortal? Also, will we ever find out how exactly Akihito came to be inhabited by Kyoukai no Kanata? Are we really to believe he was born with it? Author marthaurionPosted on December 5, 2013 Categories Kyoukai no KanataTags blood sword, red glasses4 Comments on Kyoukai no Kanata Episode 10: She was the sacrifice?? Kyoukai no Kanata Episode 9: You must kill him! 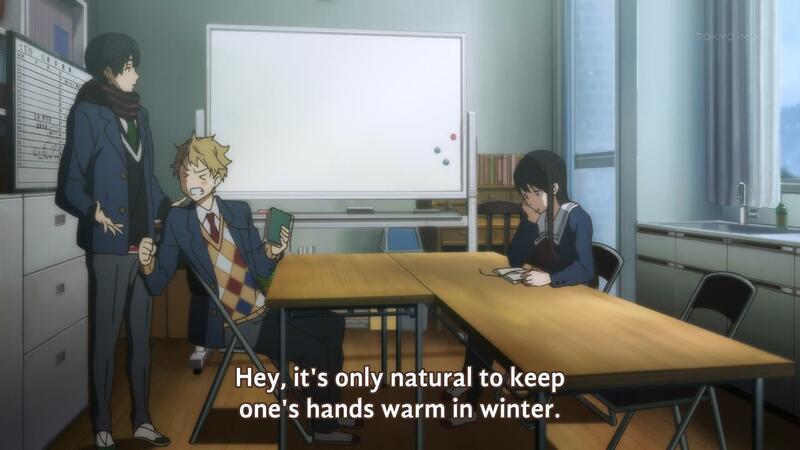 It looks like Akihito will be sacrificed. Or so it seems. Apparently, his youmu half is the strongest youmu of them all. Which makes me suspicious. The note that Hiroomi saw said that it was believed that Akihito held the Kyoukai no Kanata. Does that mean that someone put that youmu inside of him? Maybe his youmu half isn’t really inherited from his father? Maybe someone thought it would be a good idea to seal the most powerful youmu inside him (*cough* Naruto). Anyway, the preview seems to indicate that Akihito died in the fight against Mirai. He’ll likely come back (which irks me), but I wonder what happens now. I guess everyone tries to figure out why exactly the Spirit Hunter Association organized his death in the first place? Although, is that really a question? Why wouldn’t they want to destroy the most powerful youmu, who could bring ruin to humanity? Author marthaurionPosted on November 28, 2013 Categories Kyoukai no KanataTags beyond the boundary, blood sword2 Comments on Kyoukai no Kanata Episode 9: You must kill him! The Calm is upon us. Apparently it actually is a big deal as the youmu get weaker. Although, Akihito seems to be transforming back into his youmu form which should have been weakened for some reason. Ayaka makes a comment about his human form becoming weakened. Could that be from the Calm or is it something else? Because it makes little sense that the Calm would weaken his human half, right? So should we be treating Izumi as an ally or an enemy? She seems to be fighting off Miroku and protecting Ayaka, so ally seems like a good assumption. But what if it’s part a larger plot? Whatever shall we do? Anyway, next week, I assume there will be more protecting of Akihito and whatnot. Must be pretty severe if there’s a line like “I wish I’d never met him” in the preview. Will he turn again? Kyoukai no Kanata Episode 7: A plot is afoot! Well, Sakura turned over pretty easy once everyone in the cast got some free time to deal with her (you know…when they’re not busy with their idol life and whatnot). I’d say “we have a new ally”, but she left her weapon behind. I’m assuming she’s practically useless now. More dead weight, it seems. Akihito didn’t have as much of a role in this episode, which is slightly comforting. He’s not the protagonist that solves everyone’s problems. I’m not too sure what exactly this “lull” business is supposed to be. Everything comes to a halt? Does that mean a time stop of some kind? Oh well, it looks like next week they’ll deal with it. Maybe we’ll find out what this “plot” is concerning the Hollow Shadow and Sakura’s weapon. Author marthaurionPosted on November 14, 2013 Categories Kyoukai no KanataTags blood sword, spirit hunter2 Comments on Kyoukai no Kanata Episode 7: A plot is afoot! 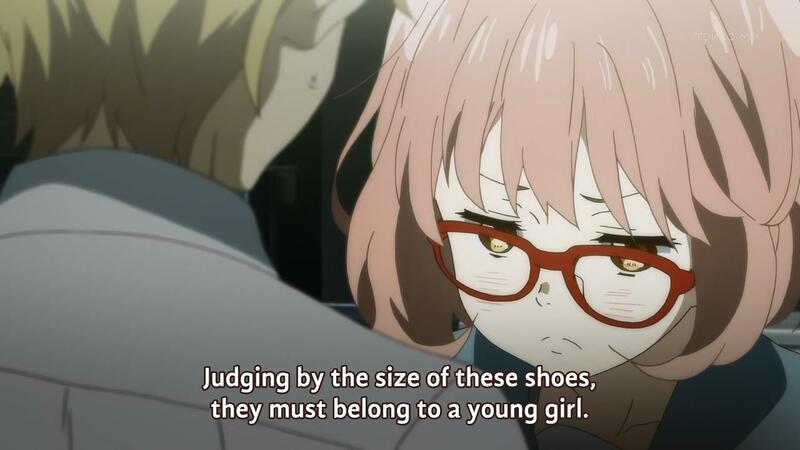 Kyoukai no Kanata Episode 6: Did this episode just class change? What kind of show are we watching? Idols? Author marthaurionPosted on November 7, 2013 Categories Kyoukai no KanataTags blood sword2 Comments on Kyoukai no Kanata Episode 6: Did this episode just class change? What kind of show are we watching? Idols? Careful Mitsuki…at this rate, you’re looking like you’ll fall for Mirai too. You’re supposed to fight her for Akihito. I don’t really get the festival thing…is the “being alone” thing the only reason she kept refusing to go or is there something darker? Because that seems like such a silly reason. Also, it looks like Akihito’s depression was kind of a non-issue? I would have expected that to be the focus of something. I’m not sure what to think, but apparently Mirai is going to have to dress up for the next dreamshade? Is there any reason she can’t just stab it like she always does? Either way, I’m sure Akihito will have to try and contain his excitement as he watches on. Well, as expected, Akihito has also had his own share of terrible deeds. Looks like he was the reason creepy scarf guy has a scar on his back. Exactly what kind of shade did he come from to make half of his power too much for everyone to handle? They hyped up the Hollow Shadow as being too strong, but this guy’s on a different level. Also, I don’t understand why they stole the Hollow Shadow at the very end. Is that supposed to mean something? Anyway, at this point, Mirai and Akihito should start becoming best buds. They have so much in common! I’m not too sure what’s supposed to happen next week, but it looks like maybe a closer look at the lollipop girl. Her family’s supposed to be powerful, right? Kyoukai no Kanata Episode 3: Siscon vs. Glasses Fetish…Fight! Silly Akihito…you should have followed her all the way instead leaving and showing up at the last minute. Anyway, it seems Mirai’s “murder” has nothing to do with her powers going out of control (although, the ring really does limit her powers) and everything to do with our first boss. I’m surprised an enemy that everyone fears so much is going to be the first one they face. Does that mean the battles become less important from here on? Next week will probably finish this battle. It looks like Akihito will leverage his immortality to kill the Hollow Shadow. Does he intentionally let himself become possessed? Also, don’t tell me he’s going to say something stupid like “oh you don’t understand…my life actually sucked…blah blah”. Author marthaurionPosted on October 17, 2013 Categories Kyoukai no KanataTags blood sword, stabby stabby2 Comments on Kyoukai no Kanata Episode 3: Siscon vs. Glasses Fetish…Fight!